Great tour. Les the guide was amazing. Great sights, great hotels and transfers. Couldn't have asked for more. This tour is the greatest! Very informative, loads of fun and great guides and great wines and scenary! Great tour, Stamford plaza is a great hotel. Kangaroo Island was a must, superb organization all the way around. Les our guide was lovely too! Amazing sights and sites, fantastic people. Ozone Hotel was nice too though the kitcen was awfully busy and service was long. One note though, AAT, please leave the pick-up times at the hotels or send them through emails so we don't have to call, thank you!!!!! Marvelous to meet the wild animals and spectacular scenery on Kangaroo Island. Fantastic wine tasting with fine dining in Barrosa Valley. 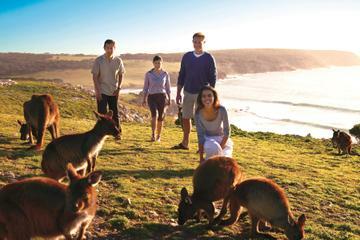 Both tour guides to the Barrosa and the Kangaroo Island are excellent, esp. Les. He is amazing and knowledgeable of the tour. He is really a great asset to your company.